Clamp-on Cleats can simply be attached and detached as required, so they keep decks clear & safe. They can be positioned where needed on existing genoa tracks, or the unique opening design allows the base assembly to open and fit over existing T tracks. The clamp assembly then screws firmly into place allowing a spring line cleat to be fitted in any position on the track in seconds. Made from very tough solid aluminium with black Nylon locking knob. 9260 clamps onto our 25mm Barton 'T' track (Part nos. 2611, 2617) and 9261 fits onto our heavy duty 32mm Barton 'T' track (part no. 0566). 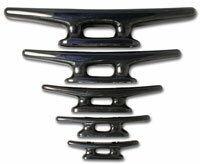 Moulded in top quality marine grade nylon so they will not corrode. They have a rounded sturdy appearance and are lightweight and very strong. Made from forged 316 stainless steel. Sold only in pairs. Made from forged 316 stainless steel. 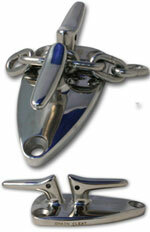 The Chain Cleat is a revolutionary new design of cleat to hold the anchor chain. It has a remarkably simple and low profile design with a unique feature which allows the chain to be easily and securely placed into the angled slot between the two horns. On boats with an anchor winch, the Chain Cleat will take all the load of the anchored boat from the winch, so helping to reduce the war and tear on the winch. Chain Cleat is manufactured in 316 stainless steel, the slot is sized to accept 6mm- 8m (1/4 - 5/16in) chain and the cleat is generally suitable for any boat between 20 - 40 feet. 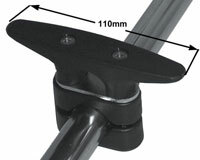 A neat fitting to clamp over Stanchions or Rails up to 25mm (1in) dia. Made from black Nylon with stainless steel screws, total length 110mm. This handy cleat simply clamps on to the shroud without causing damage to the wire. 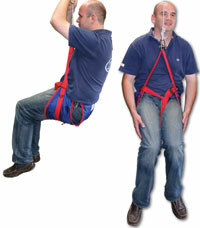 Complete with backing plate and fastening screws it can be fitted in seconds. Ideal for securing pennants and signal flag halyards. Suitable for wire up to 8mm. Strong open based cleats made from aluminium. Lightweight, ergonomic shape, made from cast aluminium. 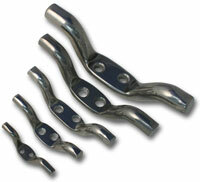 Lightweight cleat, made from cast aluminium. Made from aluminium. Sold only in pairs. High quality bolllards manufactured from mirror polished 316 stainless steel. Made from cast stainless steel. 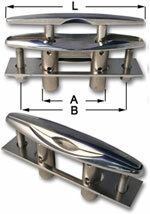 Sleek, mirror polished stainless steel pull up cleats as used on prestige yachts worldwide, available in 3 sizes. Made from 316 Stainless Steel. UNC Nyloc nuts provided. These small cleats are excellent for a wide range of control line cleating applications. 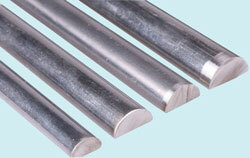 They are suitable for all types of line up to 6mm. Their aluminium spindle-grip means they are very hard wearing and have minimal run-back after cleating. They are also very light weight at only 20gms each.